Before we start everything else. we would like to mention Pedigree in their new cause. 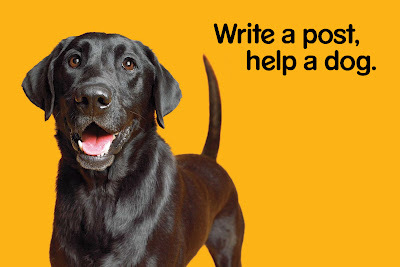 Have you joined Pedigree's program "Write a Post, Help A Dog"? If not, here's how it goes: from now until midnight on June 30th, for every blog post that mentions Write a Post, Help a Dog, Pedigree will donate one 17lb bag of dog food to shelter dogs in need! It's so easy, everyone should do it! Thank you for your patience, dear bloggy friends. We are still recovering our data from the damaged hard drive partitions. I, Haopee, have been staying up until 4 AM in the morning doing this. In the mean time, please enjoy this adorable pack sibling photo. I have documented Chooey's first bath. After 3 months of being smelly Chooey, now she is known as LESS smelly Chooey and everybody wants a piece of her- even Peanuts. Have a wonderful weekend. I will do my best to visit you guys soon. Aw, good luck with those computer problems! I loves me a good bath, but I loooove the water. Have a good Saturday! Grrrrr, we hate computer problems!!! A bath??? Yikes, I hate baths!!! BOL!! You great Chooey!! Thats a good cause. I am not a fan of Pedigree food, I think its not very good quality but I am glad they try to help homeless animals. We are not big on baths here, no one seems to like the water. I love all those photos of you guys- cause I like looking at you! How will I ever find your if all the smelly is gone? But it does feels good to be clean- right? I hope your computer gets well.... I know it is stressful and even more so if you don't know your computer is sick. Its very nice of you to help all those hungry doggys. We do hope that we have. We know there will always be hungry doggies in the world and it's just sad. Thank you, Dear Tweedles. We love watching your lovely eyes too! What a lot of work for you with those 'puter issues. We hope you get it all sorted out soon. Oh no! Sorry to hear of your computer woes. That is never fun. Thanks for sharing that pawsome photo! 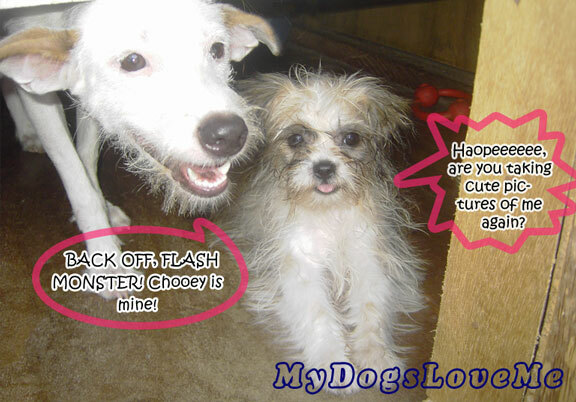 Well done for joining the Pedigree blog for dogs. Don't humans just drive you crazy with those cameras! Yes. But I believe I've officially desensitized the girls in the flashing beast. LOL. Hahaha! Less smelly Chooey. BOL. Love the way Chooey's fur is all over the place. Really! I didn't know that. You know you guys could've searched "Haopee" in Google and this would probably pop out. I hope when you clicked on my name, my bloggies showed up. I remember having that one problem that people aren't able to locate my blog. LOL. Cool post, I did one too, so I hope the pals waiting for furever homes will have full tummies while they wait.